Although a mail merge is done in Word, you can use an Excel spreadsheet. Make sure that the field names are in the very first row when doing it. Also, you need to know that zip codes in the northeast begin with a “0” and will not convert correctly in the merge. You MUST convert the spreadsheet into a CSV file which is done doing file save as and choosing this function from the drop down arrow. 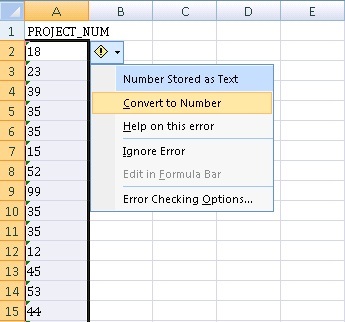 This video demonstrates the merge function and towards the end how to convert the spreadsheet. One trick I learnt recently is to right click on the shape you want to draw and then select the Lock Drawing Mode option. With this you can repeatedly draw the shape number of time of different sizes. To return to excel mode press escape. Recently I was going through a huge projects related data file in excel. One of the column has project numbers but was in text format. There was green triangle on the left side of the cells. The data was downloaded from database management of a company. Due to this I was unable to apply formulas on these numbers. My first instinct was to select the column, click on the error message and select the option of convert to numbers. Which I did as well and it took long time i mean really long time to happen. In my previous article about the Subtotal function, I promised I would follow up with one of my favorite hacks: using the subtotal function with conditional formatting. Prepare to be dazzled as I show you how to use the Subtotal function with conditional formatting to group rows to make them easier to read. However, before we go there, I should mention that, even though the Subtotal was first released in Excel 2007, it was actually deprecated in 2010 with the addition of the Aggregate function. The Aggregate function is similar to Subtotal, but even more powerful. I continue to use Subtotal because, although it has been deprecated, it is still available. Using Subtotal allows my spreadsheets to be used by all versions of Excel from 2007 and on; which still has a significant user base. I have worked on a few projects recently where the data pull was in JSON format and not the spreadsheet-ready database pulls that I am used to from my SQL queries against a database such as MySQL, Vertica, Postgres, etc. I am not a programmer and the JSON format is not something that I am used to working with comfortably yet, so I set out to investigate ways to pull JSON formatted data and get it into a working format (in this case a spreadsheet). I am planning to write soon on techniques to pull and parse data in RStudio. My hope is that this post may help some people get to work with their data quickly without having to wrestle too much with parsing the data into an analysis-friendly format. As I began to think about outbound marketing, I can’t remember the last time I haven’t screened a call from a 1-800 number or answered the door and engaged with door to door salesman. I personally believe that outbound marketing is starting to decline, and people are less receptive to blanket marketing advertisements or cold calls. 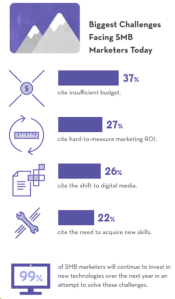 SMB marketers invest in new technologies to solve their challenges, according to a Marketo study. At Bid4Ad, we thrive to provide SMBs with an online platform to facilitate their ad space bookings!